As I glanced out the ship’s window during breakfast, I realized we were approaching the city of Valletta, Malta. I grabbed my camera and headed out to the nearest deck. The previous night the cruise director on our Adriatic Sea cruise told us that entrance to this city was one of the most spectacular of any European port. So a few remaining bites of muffin weren’t enough to keep me from hurrying outside to watch the dramatic entrance. 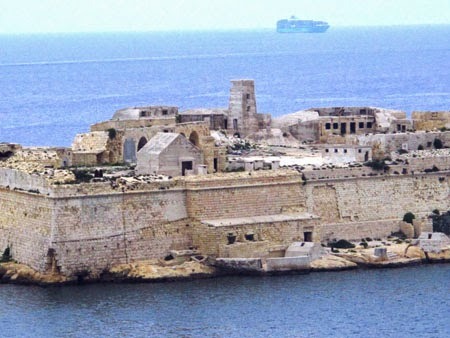 Massive fortifications protected the ancient port of Valletta, Malta. 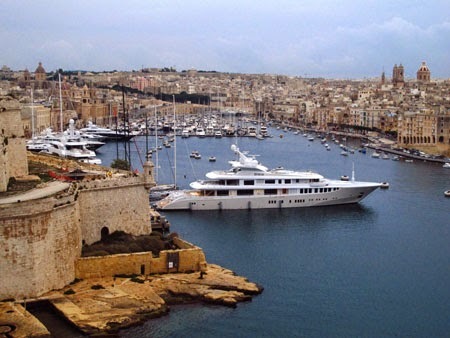 Founded during the Crusades by aristocratic families (called a city built by gentlemen for gentlemen), Valletta was developed by Knightsof the Order of St. John, who fortified the harbor to defend against pirates in the 16th century. Named for Jean de la Valletta, Grand Master of the order and hero during the Turkish Ottoman war, the city retains these massive fortresses and walls on both sides of the inlet. The heavy fortifications instituted by de la Valletta were utilized over many centuries as protection against invasions from Phoenicians, Romans, Arabs, Berbers, Turks, and the British. Why did so many civilizations attack Malta? Because of its strategic location in the middle of the Mediterranean Sea. Located 52 miles south of Sicily, the island was important to invading nations, even as recent as World War II. 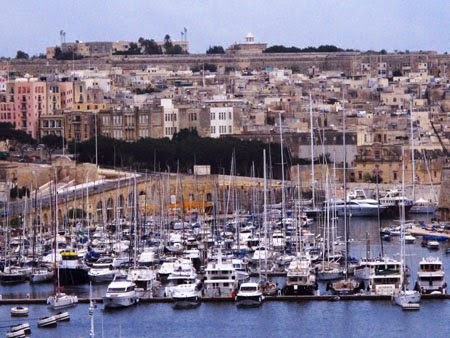 The protected inlet made Malta a preferred destination. These ancient stone fortifications truly were incredible, a sight not to be missed as the ship moved slowly into the harbor. Large, craggy walls and imposing buildings made of cream-colored limestone contrasted with the blue-green of the sea creating a scene that could have come straight from a Medieval-era movie. The harbor is still a busy place today filled with cranes loading and unloading multitudes of ships that use the port. During a tour around the island by jeep, we learned that the Maltese archipelago consists of three inhabited islands of which Malta, population is 370,000, is the largest. 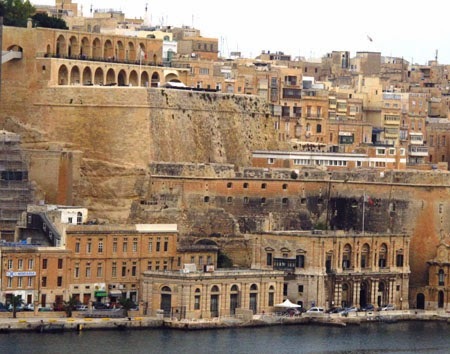 Valletta is the capital and largest city of this independent nation. Built on rocks at the water’s edge, the city extends above the sea on a secondary level accessed by a steep path—or a modern lift (elevator). Since the island is composed of limestone, many buildings are constructed to blend into the landscape, which gives it a clean and neat appearance. A modern highway winds through newer government buildings, schools, and shops on the upper level. Valletta extends onto a second level above the sea. Malta became part of the British Empire in the early 1800s, so there is a large British influence, and most tourists are from the UK. During our jeep tour, we met a British family who had relocated to a small waterfront town to experience a slower pace of life. They were somewhat surprised to see American visitors, but we found Malta to be delightful, and I’ll tell more about our tour in another article.